Don’t be afraid to tap into your feminine energy: Women influence more than 80% of all consumer spending, yet the blockchain industry is being designed and built predominantly by men. As blockchain is commercialized, there is a very exciting and lucrative gap to define women’s needs in the space. Our story as leading women in blockchain is a unique one. We did not enter it from the buying and selling of Bitcoin like most others. Instead, we have over 25 years experience working around the world identifying and building new industries, strategies and processes for Top 100 companies through to the most innovative and creative startups. We were both seeing the infant impact of blockchain in our industries and business networks, which led us to really explore the potential of blockchain and cryptocurrency and its effect in society and our clients business models. We knew that two elements would need to shift into play to really unlock the greatest good from blockchain: (1) The global community of existing business thought leaders would need to be involved; (2) An early focus on blockchain education is paramount. As best friends since University, we both built careers focused on business strategy, advisory and execution. Charlotte chose a path through investment banking, strategy consulting, digital / technology and startup growth hacking. Gelareh chose a path through business change consulting, project management, Executive coaching and building real-world business communities. Between the two of us, we have advised and created growth for businesses in almost every industry and geography around the world. So it was natural to throw ourselves into help shape, lead and grow the latest industry revolutionalizing the world: blockchain. Let’s share the ICO of a new global live music event brand and the design of the world’s first center for blockchain innovation and education. For the first one, we are supporting the launch of a new global live music event brand — Mfusion. Mfusion Corp are launching a public ICO in December 2018 — February 2019, with the creation of the Mfusion blockchain, coin distribution and deployment of the Mfusion wallet to follow in March 2019. In parallel, they are filing a prospectus to take Mfusion Corp public on a US stock market, with the goal to make it possible to convert the Mfusion coins to shares of the corporation. The interplay between Blockchain and Crypto industries with traditional forms of business growth is an especially exciting place for us to be right now. For the second one, we are designing the world’s first center for blockchain innovation and education. The first location-dependent center is in Asia. Our goal is to create the perfect education and growth platform for the world’s experts and businesses to collaborate on blockchain, as well as the perfect platform for funding and development of blockchain projects. What are the 5 things that most excite you about blockchain and crypto? Using blockchain to renegotiate trust between consumers and companies. Building new strategies that leverage the technology to open up new cross-industry business models. Creating financial empowerment for creative entrepreneurs and innovators through blockchain-based crowdfunding. Helping local and small businesses to re-distribute profit back down the value chain from the multinationals and middlemen. Women’s ability to lead the blockchain revolution from the ground up. What are the 5 things worry you about blockchain and crypto? Companies succumbing to ‘The Innovator’s Dilemma’ and not investing in blockchain by it being under-hyped and under-valued at the Board level. Investment in resources and education not keeping pace to offset the impact of blockchain and crypto. The most notable showstoppers being surges in energy consumption and displacement of human labor. Governance around blockchain and digital currency being resolved in ways that restrict the maximum potential for good. Lack of understanding and investment in talent and education around blockchain and digital currency. Blockchain projects being built for short term gains and impact rather than developing long term strategies to drive purposeful change. We have taken a lot of personal risks to get to where we are in our lives and careers. We had to fight not only our own insecurities and fears, but that of almost everyone around us. Despite having so much uncertainty over where we were going, we stepped into the global arena and challenged ourselves to find out what we were made out of. Neither of us have had strong female mentors to guide us on this journey, so we use our success to educate and elevate the women around us to create a life that is aligned to them as individuals…and to help them gain access to the opportunities from female mentors that we didn’t have ourselves. Become a ‘go to’ expert: Women don’t need to enter blockchain with traditional coding expertize. Instead, use your existing skills and passion to carve out a niche in the blockchain industry where you can become a ‘go to’ expert. 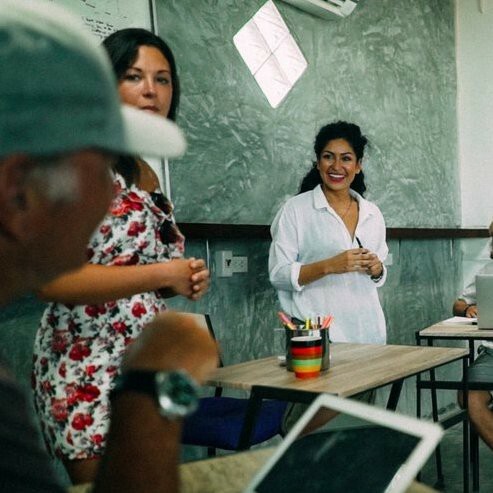 Education, education, education: A combination of industry education, leadership skills and empowerment will unlock pivotal ideas from women in the blockchain industry. Go for it! The stats say that women own just 5% of the market cap for cryptocurrency, and have represented just 8.5% of people on the founding teams of blockchain companies over the last 6 years. This is such a huge under-representation of women. We are at the place in the adoption curve where we need both talent and gender diversity to drive growth of the industry to the next stage. We’re not just talking about technical talent here…the industry needs a lot of new non-technical talent too. So it is the perfect industry for women to take the lead. To engage more women, we first need to break the misconception that technical expertise is a precursor to working in blockchain and crypto. There are huge career opportunities for people with non-technical expertize to thrive in the industry, and this is a fantastic place for women to make their mark, showcase their talent and take a lead. What is your favorite “Life Lesson Quote”? For the momentum in the blockchain revolution to continue in a direction where it can make a truly positive impact, we need to apply a proactive approach in recruiting industry experts to complement existing blockchain development. Our current focus in the blockchain industry is to create change champions out of global experts, multinationals, investment funds, governments, regulators and blockchain innovators. By bringing these stakeholders into a single community we can start a movement to promote collaborative innovation and education in the blockchain industry for the greater good. We encourage stakeholders to get in touch with us to make this happen.